Crowns can be made of various materials including different metals, porcelain or porcelain fused to metal. Patients have to care for their crowns by brushing and flossing, just like their natural teeth. Crowns are very strong and can last for many years when properly cared for. When a tooth is lost, if there are healthy teeth on either side of the space, a bridge is an option. 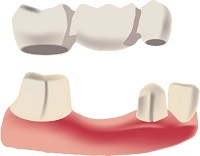 To place a bridge, the teeth on either side of the space must be shaved down and shaped to receive crowns which will be attached to the artificial tooth to eliminate the space. When there is a space after tooth loss, it is important to fill the space with an artificial tooth to prevent remaining teeth from drifting out of line, and to prevent other problems. A bridge can not be removed and is permanently cemented in place.